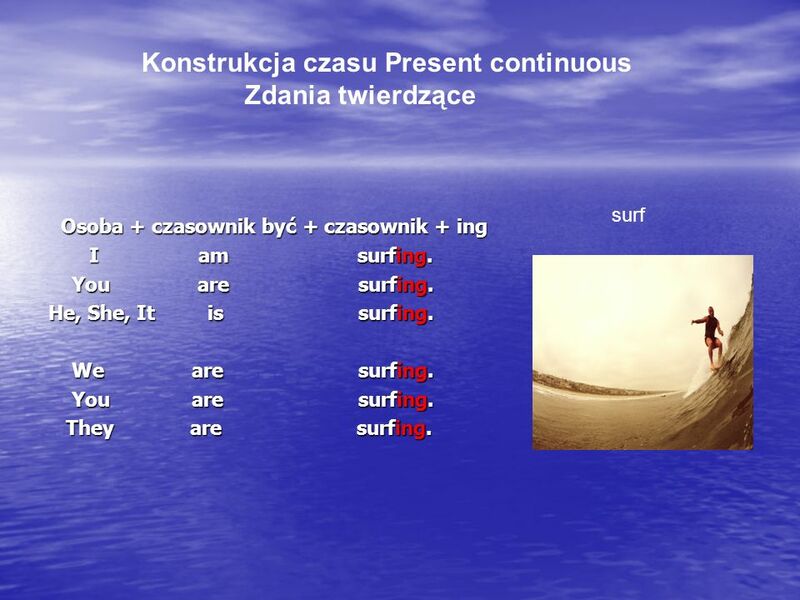 5 Zdania przeczące Zdania przeczące Osoba+ czasownik być+ not+ czasownik + ing I am not surfing. I am not surfing. You are not surfing. You are not surfing. He, she, it is not surfing. We are not surfing. We are not surfing. You are not surfing. You are not surfing. They are not surfing. They are not surfing. 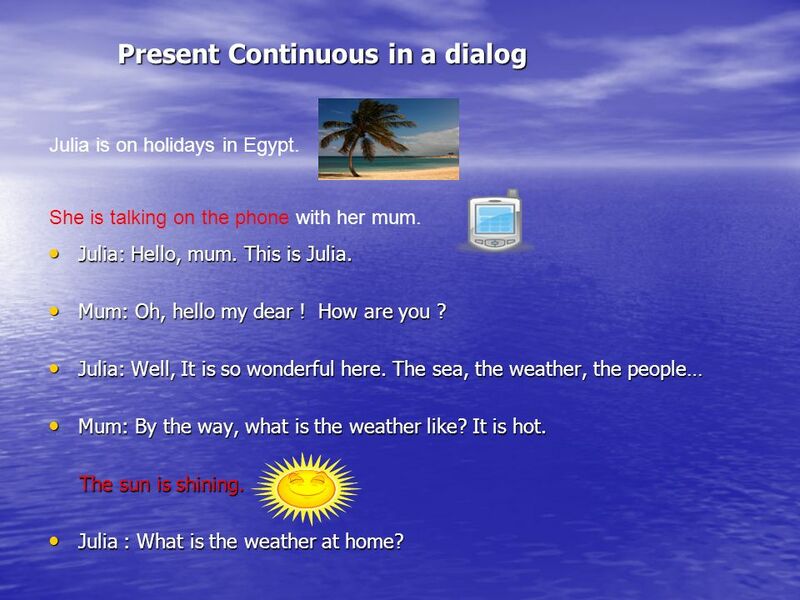 7 Present Continuous in a dialog Present Continuous in a dialog Julia: Hello, mum. This is Julia. Julia: Hello, mum. This is Julia. Mum: Oh, hello my dear ! How are you ? Mum: Oh, hello my dear ! How are you ? Julia: Well, It is so wonderful here. The sea, the weather, the people… Julia: Well, It is so wonderful here. The sea, the weather, the people… Mum: By the way, what is the weather like? It is hot. Mum: By the way, what is the weather like? It is hot. The sun is shining. The sun is shining. Julia : What is the weather at home? Julia : What is the weather at home? Julia is on holidays in Egypt. She is talking on the phone with her mum..
8 Mum: No good! It is raining. Mum: No good! It is raining. Mum: Ok, forget the weather. 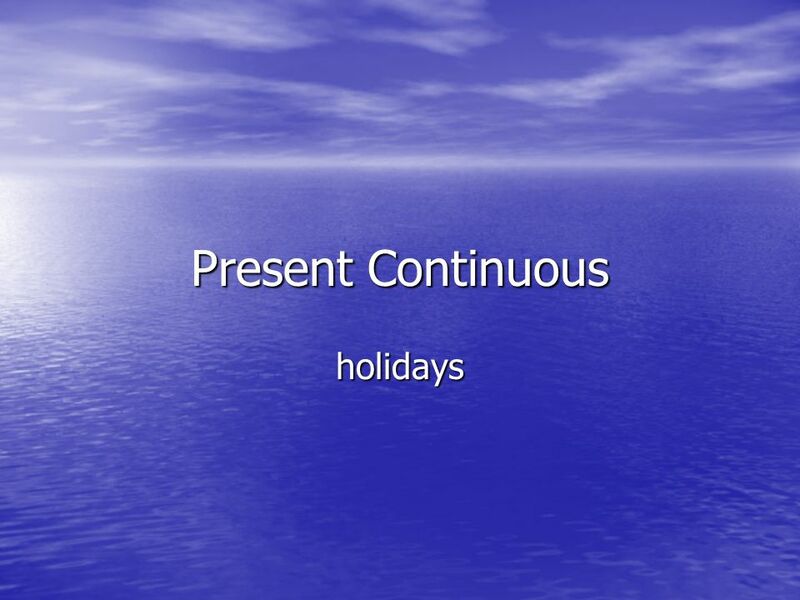 What are you doing now? Mum: Ok, forget the weather. What are you doing now? Are you sunbathing? Are you sunbathing? Julia: Yes, we are. Julia: Yes, we are. Mum: What is Jenny doing now? Mum: What is Jenny doing now? Is she bathing in the sea? Is she bathing in the sea? Julia: No, she isnt. She is collecting shells. Julia: No, she isnt. She is collecting shells. 9 Mum: Are Chris and Mark diving at the moment? Mum: Are Chris and Mark diving at the moment? Julia: No, they arent. They are playing beach volleyball. Julia: No, they arent. They are playing beach volleyball. Julia: What about you, mum? What are you doing? Julia: What about you, mum? What are you doing? Mum: Guess! Mum: Guess! Julia: Are you working on the computer now ? Julia: Are you working on the computer now ? Mum: Thats right. I am talking on the phone with you, too! Mum: Thats right. I am talking on the phone with you, too! Mum: Oh, somebody is knocking at the door. Mum: Oh, somebody is knocking at the door. I must finish. See you my dear!!! I must finish. See you my dear!!! Julia: Take care, mum. Bye! Julia: Take care, mum. Bye! So i Neither Aby zgodzić się ze zdaniem twierdzącym, używamy konstrukcji so + odpowiedni czasownik posiłkowy + podmiot. Aby nie zgodzić się ze zdaniem. Testy. Test I 1. You dont have to watch the move if you dont want to. 2. How old is your sister? 3. We are going to meet Tom next week. 4. They live in. DIALOGUE Receptionist: Hello, Oxford Football Club. Adam: I want to join the club, please. R: Whats your …………………………………? A: Adam. R: And whats your ……………………….……. ?